Little Zombies: Cam Jansen and the Secret Service Mystery: Click! It is a big day at Cam’s school. The governor, who is running for president, is visiting for the dedication of a new library. Police officers, Secret Service agents, photographers, and news reporters are all there to hear the governor speak when . . . bang! A loud sound like a gunshot startles everyone during the ceremony. Was it really a gun, or a noisy cover for a crime? 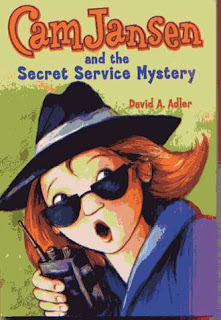 Click along with Cam as she teams up with the Secret Service to solve the mystery. An exciting installment in the much-loved series, this newest Cam Jansen mystery will win new readers and please longtime fans. Robot's Review: I've read a few Cam Jansen books now, but I think this is the first one that I did. I thought it would be like a Jigsaw Jones book. And pretty much, it is, except that this girl has a photographic memory. Which is kind of cool to read about at first. (Of course the whole spiel is retold in the other stories...in pretty much the same way. Which I estimate to be about half a page's worth of writing. Basically- Cam's real name is Jennifer. But when they found out she had photographic memory they nicknamed her 'The Camera', which got shortened to Cam. And they also use to call her 'Red' because of her red hair. And she goes "Click" when she's going through her mental camera...or taking a picture. Yep. Anyway, these mystery books are ok. The only problem I have with them, is that it's kind of scary isn't it? I mean to a first or second grader I think it could have the potential to scare them. Just worry about bad guys and stuff. But if you're not afraid of that, then this could be a good series for your kid. My son wasn't interested in these books. Well-he didn't even try to read one. But when I asked him if he would read it, he said no. So maybe for girls.